Our family gets together every Sunday evening for dinner and some kind of activity. Yesterday we went swimming, well, they went swimming. I sat in the hot tub and the sauna. I was tired, very tired and the idea of playing in the pool was more than I could muster up. It was fun watching them, I did enjoy that. My sons are so big! Men. And, it's mind boggling to see them with their wives. Time goes by so quickly, especially when looking back! When my three older boys were little it was hard to imagine that they would ever grow up! They are good men, good husbands, and good sons. In a few years, I'll be saying the same thing about my two younger ones. We joke a lot about how we'll be in wheelchairs by the time our daughter walks down the aisle. And, when she's having the same old temper tantrum, I question if that time will ever come! My Family is a blessing, God has been so good to me. I enjoy my sons, my daughters, and the life God has given all of us. I always look forward to seeing them and hearing about their lives. God is good. Family, it is good. God's family has been good to me as well. I have been purchased with His blood, brought into His family. I've experienced tender love, and intense squabbles. His children are my siblings, and we have learned to grow up together and learned to extend compassion and grace upon each other. Some members of The Family are like lost sheep. They have wandered off. I know the Good Shepherd will go after them, and I can leave them in His care. He knows their hearts, needs, and desires. My heart is for their good. Good Shepherd, use me today to further Your Kingdom. Use me in Your Family. You have promised to extend Your hand over us and bring us into Your fold. You are good all the time, and I can rest in that. Say That Again, Jesus, Your hand is extended over all of Your family! your family seems very close, much like my own. 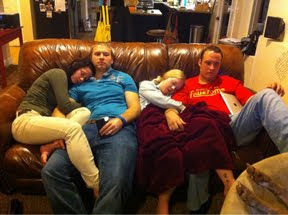 i love this picture of the kids sacked out!